An aggrieved Yeovil Town boss Darren Way felt that the officials ‘lost their way’ by sending off two of his players inside the opening half hour of their 3-0 defeat to Luton on Saturday. After conceding early on to Elliot Lee’s strike, the Glovers then had Ryan Dickson dismissed for what was a clear and blatant shirt pull on Danny Hylton as the Luton striker tried to turn in the rebound from Olly Lee’s shot. It got even worse for Yeovil when Francois Zoko was then dismissed after an off the ball incident with Alan McCormack as well, leaving the hosts down to nine men with an hour still to play. However, Way told Somerset Live he had spoken to referee Brendan Malone before the game about Town’s leading scorer, as he said: “I warned the referee before the game, and I said to Hylton after the game that he’s a very good player. 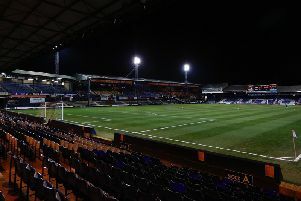 “McCormack, with all the experience that he’s got, is a good player, and the supporters that have seen the last two Luton games have witnessed exactly the same thing. The fact that Dickson was shown red, even though the rules state that is the punishment for deliberately denying a goalscoring opportunity, was a bone of contention for Way too as he added: “We’ve had the same incident which was Sam Surridge against Barnet. "He gets kicked and it’s a clear goalscoring opportunity and then the opponent doesn’t get sent off. “Then we have the same incident today but apparently he’s got to be sent off, so as I said, there’s no clarity and then there’s an air of frustration from the supporters, from the players. “I wanted them to control themselves throughout that moment and then I haven’t seen the incident with Zokes but he gets sent off. “However, it was a great effort, great commitment, and a very young team.